Vitamix Vita Prep 3 Review: The Best Commercial Blender In 2019? Vitamix Vita Prep 3 Review: The Best Commercial Blender? If you’re looking for a high performance blender, then the Vita Prep 3 may have already crossed your mind. But how can you really know for sure that this blender is the right one for you? After all, there are several other blenders that are just as powerful and have similar features as this one. To help you answer this question, we’ve listed all the key features, benefits and issues concerning the Vita Prep 3 blender. 1 Why is the Vitamix Vita Prep 3 worth considering? 2 What do other reviews of the Vita Prep 3 say? 3 How does it compare to other models like the Vitamix 5200 and 750? 4 Where can you buy replacement parts and accessories? 5 What’s the best price for the Vitamix Vita Prep 3 bender? 6 Verdict: Is this Vitamix blender for you? Why is the Vitamix Vita Prep 3 worth considering? It’s designed to endure the demands of a professional kitchen. With a motor that has a peak output of 3 HP, you can maximize this blender on a variety of ingredients: from ice and whole foods to the toughest of vegetables. More importantly, this capacity means you can use the blender to grind, chop, blend, or puree ingredients for an extended period of time without worrying about using it too much to the point of overheating. Normal blenders come with 1000-1500 watts of power, so imagine what doubling that can accomplish. It comes with a tamper tool that allows you to blend thick mixtures. With other blenders, people usually encounter the problem of having to stop the machine to make sure that thick mixtures are blended well and that there are no air pockets. While other blenders simply cannot work on thick ingredients, the Vita Prep 3 solves this through a tamper, which allows you to push ingredients down to the blade without necessarily coming into contact with the blade itself. Even if it’s professional-grade, the switches and controls make this blender very easy to use even for newbies. The speed control knob and accelerator toggle ensure that you get the right texture for your blends (from coarsely chopped nuts to the smoothest meat pates and pureed veggies). The dial is manually-operated as well, so you can easily control the speed down to the precision of the texture that you need. As a bonus, you get a 54-page recipe manual. Vitamix wants you to maximize this blender for all it’s worth, so you also get a recipe book that clearly outlines variations and methods that you can use for several menu items. The recipes come in commercial volume, so you can definitely benefit from this if you own a restaurant, catering business, or are used to entertaining a large number of guests. While other blenders only come with a 1-year warranty, Vitamix gives you 3 years worth of peace of mind against defects in parts and workmanship, as well as a 1 year service contract for those living in the US and Canada. What do other reviews of the Vita Prep 3 say? Vitamix products are generally highly rated and customers who have tried the Vita Prep have found it to be well worth the price. Most comments come from restaurant owners and chefs who have nothing but praises for the durability of this 3-hp blender, which they use and abuse every single day. They find the blender to be effective for making salsa, pesto sauce, vegetable soups and purees, ground meat, and so much more. They’ve done this without having to replace any of the blades, because the VitaPrep is built to last. One customer even remarked that they have had the blender for 5 years and it still works as efficiently as when they first had it. Other reviews also remarked on how easy it is to use the blender. It’s dishwasher-safe, so all you have to do is pop it in the dishwasher. Customers also find the switches and controls quite easy to use, so anyone can use it and adapt to the knobs easily. Another one of the blender’s standout characteristics is its power which even surprises some of the users. Based on their experience, it can really crush anything you put inside it and the motor will not die down on you. Some customers have remarked on their past experiences with other blenders that cannot go on after multiple uses (especially with difficult ingredients), but they have encountered no such problem with the Vita Prep 3. 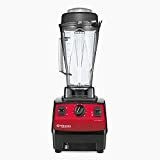 That said, because this is priced higher than normal blenders, some comments highlight that while this is blender is ideal for any commercial kitchen, it may not be practical for a home kitchen. You don’t really need to spend all that money on a 3-hp blender if you’re not going to maximize its use anyway. Because price is a very important variable in any purchase decision, there are those who think this blender is a little too expensive for home use. How does it compare to other models like the Vitamix 5200 and 750? Compared to other Vitamix models like the 5200 and the 750, this Vitamix Vita Prep model is the most powerful of the 3. The 5200 peaks at only 2-hp and the 750 peaks at 2.2-hp, although all 3 have more power than other brands of blenders. Another point of comparison is that while all 3 blenders come with a 64 oz container, the Vitamix 750 is low-profile, more compact and can fit better under most kitchen cabinets. It has a quieter motor as well but it’s also the priciest of them all. All 3 blenders also come with cooling technology and a thermal protection system, which makes sure the blender doesn’t overheat even when you’re using it for long periods of time. However, the Vita Prep 3 in particular comes with an advanced cooling fan, which ensures it works well even at the highest setting. Where can you buy replacement parts and accessories? The best thing about it is that because you’re purchasing directly from Vitamix, everything you get comes with a warranty, the Vitamix seal of quality, and two-way shipping. So this means that not only do you get warranty for the blender itself, but if you purchase accessories and parts through the Vitamix website then you get the same proection even for its components. What’s the best price for the Vitamix Vita Prep 3 bender? The Vitamix Vita Prep 3 blender is a tad more expensive than your normal blender or juicer, so finding the right deals online would help you save money. The price varies from each online sellers ($535 on eBay, $533.99 on EverythingKitchens, $595 on UK Juicers – if you live in the United Kingdom). I’ve often seen crazy deals on Amazon, with up to 50% savings from the listing price. Only problem here is that Amazon keeps changing the prices. I highly advise you to check the best current deal directly on their listing. Of course the blender could also be available in stores near you, but if you want the cheapest price for it then purchasing the Vita Prep 3 online is the way to go. Verdict: Is this Vitamix blender for you? There’s no questioning the efficiency of the Vita Prep 3, but the question of whether this product is for you depends on (1) how much you’re willing to spend on a blender and (2) how often you’ll be using it. The price of the Vita Prep 3 is very prohibitive and not a lot of people are willing to spend that much money on a blender they can use in the home. But if you’re willing to spend more than $500 for a blender, then by all means, go ahead and buy this model. At the very least it will assure you of wonderful results every time you use it. And having this blender on your countertop will certainly make your kitchen more stylish and modern. Another factor to consider is how often you’ll use your blender. If you’re just going to use it occasionally then why spend so much for something you’ll rarely use? On the other hand, the Vitamix Prep 3’s 3-hp motor makes it an ideal blender for commercial use because it can withstand the workload easily. So if you’re chef, a coffee shop owner, caterer, or a restaurateur, then this blender may just be what you need. It’s dependable and you will not have to worry about getting a replacement for it anytime soon. And considering its unparalleled performance and power the Vitamix Prep 3 can make many of your tasks in the kitchen a lot easier and simpler. Read Next: Blendtec Total: Is It Worth Buying a Discontinued Blender?